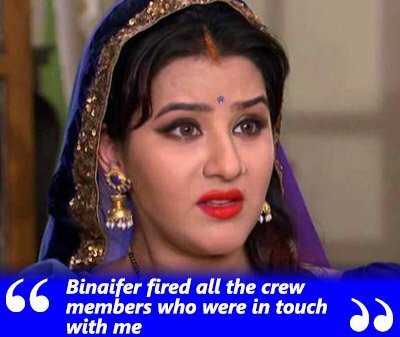 Shilpa Shinde is in the headlines since last afternoon as she has accused Bhabi Ji Ghar Par Hai producer Binaifer Kohli’s husband Sanjay for sexually harassing her. To know more about the matter, we exclusively met Shilpa a few hours back. Don’t you think you took too long to file the sexual harassment case? No, I don’t think it’s late because it’s not easy. I was going through a bad phase but now I want people to know the actual reason behind me leaving the show (Bhabi Ji Ghar Par Hai). My co-actors have given statements which said I am a psycho. If I left the show for another lucrative project, why haven’t they seen me in a Karan Johar or Sanjay Leela Bhansali film yet? They said that I had tantrums on the set, I was demanding money , and that’s why I was asked to quit and then they slap a notice on me stating to resume the shoot in 48 hours or else I’ll have to pay them 10 crores? All this was just cover up to keep the real reason hidden. I am still under that trauma. I can share my doctor’s number and she will tell you what I have gone through. For you it’s one year but for me it’s just started- half of the time I was recuperating from my illness. They tortured me so much that I fell sick and had to undergo a treatment. They used to record my phone, Binaifer cleared her side smartly but I am still suffering. After torturing me for 7-8 months with support of CINTAA, in spite of doing an out of court settlement they have applied arbitration in court and are now asking me to pay 12.5 crores . But now, I will not keep quiet and fight for myself without worrying about anything. What about your make-up man Pinku Pathwa? They fired him. Not just him, they fired 6-7 people from the set who were in touch with me. Please go and ask them why did they throw them out? They were the production house’s staff not mine then why did they do this to them? According to you, Sanjay’s wife Binaifer was aware about Sanjay’s behaviour? I replied saying that she can’t talk to me like that, it’s ok if she doesn’t want me to work in the show, main iss show mein kaam karne ke liye nahi paida hui hun, but I will meet channel officials as I wanted to clear out a few things. After 2 days of my conversation with Binaifer, I read Soumya Tondon’s statement, “Blouze ki fitting kharab hone ki wajah se koi show kaise chhod sakta hai “. Yes, you are right, nobody will leave the show for such a small reason- there was a bigger reason which was this (sarcastically). Are you upset that none of your co-stars supported you after your exit from the show? No not at all. But I feel people should know it’s a small industry and we will get to see each other soon. The producers banned everyone on the set to talk to me. They recorded mobile phones of their cast and crew, whoever spoke to me. I really want to know who gave them the right to record anyone’s phone call. They have done this so that truth doesn’t come out and no one supports me. Do you have any proof to support your case? What more proof do you want? I left such a successful show- I am not a kid to do that for just any other reason. Yeh proof kam hai? Yes, it’s true but portrayed in a wrong way. I had sent Diwali sweets for the cast and crew of Bhabi Ji Ghar Par Hain. Binaifer messaged me saying don’t you dare come on my set or do such things, we are in a legal tiff. In fact, she even asked people to throw the sweets. So I said Okay, I’ll send those sweets to your house. That’s what I did and wished her Happy Diwali. We hear that you faced difficulties in filing the FIR? Yes, as the Police station is in their location and not mine. It looked like that police is not taking care of them, in fact Kohlis are taking care of the police. Inspector Mahesh Patil made it very tough for me. For 3-4 days he asked me to go from here to there. He also asked questions like, why you coming after one year? They are not such people; I have gone to the set before. Basically, he wasn’t ready to register the FIR. I asked him abruptly will you file my FIR or else I know other ways to fight. Any message for Binaifer & Sanjay before you see them in the court? Nothing, I really don’t care about them.